Genesis 37: 1-4, 12-28; Psalm 105: 1-6, 16-22, 45b; Romans 10: 5-15; Matthew 14: 22-33. Since last weekend, each of us is aware of the real living – and dying – conditions for soldiers in World War I. We have not descended into glorification and over romanticism. Instead, this centenary of commemorations has started with a stark realism that has helped many of us realise the brutality of war and the fears faced constantly by soldiers and civilians over the five years of World War I. ● Stephen Edward Comerford of the Royal Dublin Fusiliers, who caught malaria in Thessaloniki and was sent back from Greece to Dublin in May 1916, dying in hospital in January 1921. ● Patrick Culley of the Royal Army Medical Corps, who spent World War I in the trenches and came home with what was then called “shell shock” and what we now know to be Post-Traumatic Stress Disorder. Some time ago, we spent a few days walking through the streets of Thessaloniki, imagining the nightmares my grandfather must have seen: young men, half his age, young enough to be his sons, wounded maimed and dying; imagining his own fears and nightmares as he wondered whether he would ever return home to his wife and children in Ranelagh; the frostbite and diseases he or his comrades were afflicted with in the winter when they were deployed into other parts of the Balkans; the stench of the dead water in the sump of the Thermaic Gulf (Θερμαϊκός Κόλπος) on the waterfront in Thessaloniki as he was bitten and infected with malaria. And then I imagined his nightmares, night after night, after he came home. The startling truth, though, is that modern warfare today, 100 years after the start of World War I, is worse than the worst nightmares of those who came home from Gallipoli, the Somme and the fields of Flanders. I was reminded of that in the past week as I spoke publicly at the Hiroshima Day commemorations and was interviewed about the present violence in the Gaza Strip. The fears I had as a child – of snakes, of the wind, of storms at sea, of lightning – are no longer the stuff of recurring nightmares they were as a child – I have learned to be cautious, to be sensible and to keep my distance, and to be in awe of God’s creation. In our Old Testament reading this morning (Genesis 37: 1-4, 12-28), Joseph is dismissed by his brothers, is seen by his brothers as a threat, because he is a “dreamer.” His perhaps naïve behaviour in his youth is threatening them as the older brothers, the adults. But rather than confronting their fears and dealing with them, they decide to get rid of Joseph – it’s another play-out of the constant theme of shooting the messenger rather than listening to the message. Peter sees Christ walking on the lake or floating effortlessly above the water. At first, he thinks he is seeing a ghost. But then Christ calls to him, and Peter responds. Once he recognises Christ, Peter gets out of the boat, starts walking on the water, and comes towards Jesus. But he loses his confidence when he notices the strong wind, he is frightened, and he begins to sink. Even before the Resurrection, in his frailty, in his weakness, in his humble humanity, Peter calls out to Christ: “Lord, save me” (verse 30). 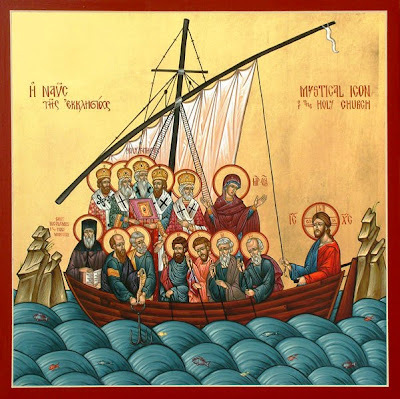 Do the others in the boat fall down at Christ’s feet and worship him because he can walk on water, because he can lift a drowning man out of the depths, or because they recognise that in Christ they can find the end to all their worst dreams and nightmares? In the sunshine last Monday afternoon, we took a small boat from Howth Harbour to the small island of Ireland’s Eye. The waters were calm, the sun was shining, there were few clouds in the sky, the tiny beaches were covered in golden sand. A few people were sailing in the water between Howth Head and the island, and two or three men were learning to paddle standing up on sailboards. But, in this come-and-go summer, we knew, as they say, to expect the unexpected. For a brief few minutes, black clouds suddenly moved across the whole scene. The weather could have turned, we could have found ourselves stranded on the island, or we could have found the waters started to become choppy, which can be a frightening experience, even on a short 15-minute hop like this. As seasoned fishers and sailors, the Disciples know not to try walking on water. They know the risk of sudden storms and swells, and they know the safety of a good boat, as long as it has a good crew. So, this morning, I do not want any of us to risk walking on water, or to play stupidly in boats in choppy waters or storms. If we are going to dream dreams for our parish, for the Church, for the Church, for the Kingdom of God, we may need to step out of our safety zones, our comfort zones, and know that this comes with a risk warning. Canon Patrick Comerford is lecturer in Anglicanism, Liturgy and Church History, the Church of Ireland Theological Institute, and a canon of Christ Church Cathedral, Dublin. This sermon was preached at the Solemn Eucharist in Saint Bartholomew’s Church, Ballsbridge, on Sunday 10 August 2014. Please credit the iconographer: Deacon Matthew Garrett of www.holy-icons.com for the icon image of the Mystical Church that you are displaying. Thank you. Thank you, I have just done this and added a link. I was not sure where the icon had come from, and shall track back the other places I have used this beautiful icon to add this information.